The year is moving right along. It is May 12th already and time for the 12″x12″ Porfolio Challenge posts. My offering this month doesn’t follow my defined parameters exactly but it is close. I hope that you enjoy looking at it. I used the Ohio Star block this month. Instead of focusing on the piecing of it, as I usually do, I concentrated on the quilting this month. Feathered wreaths and plumes fill the alternate blocks and fall into the corner patches of the Ohio Star. The center of the Ohio Star also contains a feathered wreath and all of the background is filled with stippling. The yellow fabric is a hand dyed fabric but the green is a commercial fabric. The overall size of the piece is 18″x18″. I am fairly happy with the outcome but there are things I would change if I were to do it again. I think I would adjust the sizes of the inside and and outside feathers on the large wreath and I would change the size and angle of the plumes that extend into the corner blocks. I’d like to experiment with different types of background filler too. That is what these projects are good for, learning. Wow! I sure wish I could do this, Deb. Beautiful! Will you cut this out? You are making me crazy with envy! I love how the plain square plumes look like they are bursting out of the square. Very, very pretty! Love the effect of the feather plumes coming off the wreath. I am yet to try a feathered wreath on my LA but I must find a project to give it a try soon! Your is lovely. Yummy…just plain yummy. What an artist you’ve become on this machine. This is totally gorgeous. Quilting not being a skill that I’ve acquired yet makes me appreciate it all the more in other’s work. Yours is wonderful! The yellow and green look great together too. OMG Deb, this takes my breath away! This block is great, Deb. Your quilting is fantastic! I think this type of feathered quilting is what I admire the most in quilts. I love how the feathers run into the corners of the star blocks. 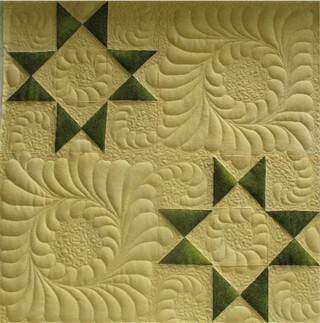 Perfect example of how quilting can make a simple pattern look exquisite. That is just gorgeous! I love the feathers! Did you trapunto them? If not, what batting did you use? Oh my! What beautiful machine quilting. I think your quilting has improved by leaps & bounds since I 1st started reading your blog. This is really spectacular!